This year I will be participating in my third year of Steve Stefani Dance Marathon, a huge event at my high school. 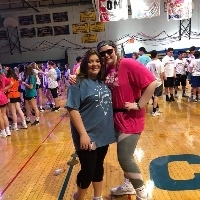 Steve Stefani Dance Marathon is an event that raises money for pediatric cancer, so that we soon one day will have a cure for this horrible illness. This year, I am a captain for the Hospitality committee, where we get together all of the food for the night of the event! The organization that this money goes towards is based out of the Penn State THON (The Four Diamonds). Last year, we raised over $240,000 dollars all for the kids! This money goes towards families struggling with medical bills from their children struggling from this powerful disease, and also to one day find a cure. Steve Stefani was a former teacher at Springfield High School who died of cancer in the early 2000's. We work so hard all year to put this event together so that ultimately, on March 29th-March 30th, we will stand for 15 hours to try and find a cure. I dance for my Pop Pop who has suffered through Prostate Cancer for a while now, and also my Uncle's, who have died from Brain Cancer and Lung Cancer a a very young age. We dance for one day to find a cure and celebrate. This event has helped thousands of families struggle through the hardest times in their lives. By donating you are impacting and helping all of these families and the pain that they endure from their children. Any penny counts and we need your help to make this amazing event possible! I believe that one day we will dance in celebration for a cure!!!!!! !